Damn this crappy computer of mine - it's playing in bits and pieces. Erm, either you're trying to watch it via YouTube or you're using an inferior web browser like MSIE which will try to play the video for you by streaming it into Windows Media Player. Either right click and save target as on the file on the site (if that's where you're downloading it from) or on YouTube just click the stop button and wait for the film to load before hitting play. I've just got around to seeing the trailer and all I can say is 'THAT LOOKS SOOOO COOL!' It looks really good and I can't wait untill you finish the actual ep!! BTW the effort that must have gone in to that must be astonishing, keep up the good work. I did save it. It's watching it from the computer, but still only going in bits. But never mind I get the gist of it lol and it looks great. Sorry it took so very long for me to view this but it's great!! Is there going to be more? Good job everyone involved! 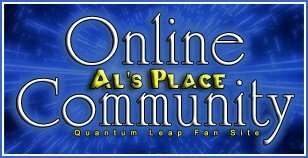 Theorizing that one could time travel within his own lifetime, Dr. Sam Beckett stepped into the Quantum Leap accelerator and vanished!